Home / Get published more quickly by sending us your prior reviews. We’ve all been there — the reviewers like the paper, suggest some major but reasonable changes, and the Editor handling the paper rejects it anyway. What now? Consider submitting it to Biotropica! Send us the reviews from your previous submission to another journal, the revised manuscript, and a letter detailing your response to the referees’ criticisms and suggestions. Our Editors have the option of accepting it without sending it for external review if they are satisfied you have adequately addressed the reviewers’ concerns. Even if we’re not sure, we may send it to only one referee, which will still make for a vastly faster review process. Not many authors have taken us up on this option — could it be people are concerned that we might be prejudiced against submissions for which we were the second choice as an outlet for publication? My response to that is “get over it”. We want your best science and we want it out there as quickly as possible for others to read and cite. If another journal was too impatient to request a revision that’s their problem. So send us your prior reviews. 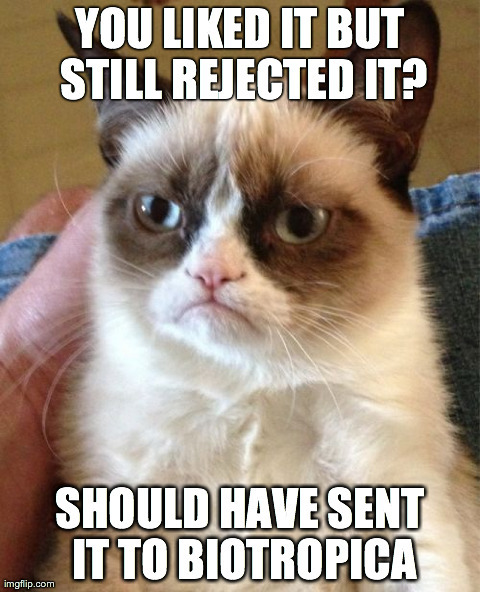 Grumpy Cat thinks you should submit to Biotropica.